We here in Colorado and at TileMosaicGirl are SUPER excited to congratulate the Denver Broncos on their AFC Championship and spot in the 48th NFL SUPER BOWL!!! It was an exciting season, one in which we watched and cheered passionately for the home team, who now will go to the “Big Show” on February 2nd, 2014! 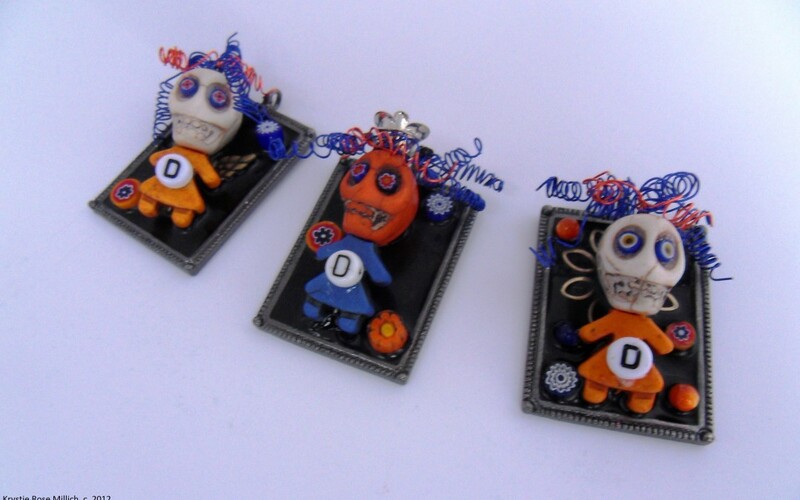 One of my ‘lucky charms’ all season was wearing my “Broncos Curly Hair Girl” pendant, handmade by me in the Mexican folk art tradition of “Day of the Dead/el dia de los Muertos” revelry! I’m just sure she helped make it happen! I thought I’d share a pic of “the girls” here, and, if you or someone you know would be interested in 1 of the few pendants I have left, you can find them on my etsy shop now. Each one is handmade, one of a kind, and comes with a chain. I can ship out and/or deliver locally ASAP to any rabid fans who need one of these chicas to help root our team on to THE championship! GO BRONCOS!! !